The persistent rain throughout the day did nothing to dampen the spirits of keen bidders who turned out for our third model railway auction of the year. In the real steam section this Aster Flugurex gauge 1 GWR 6000 ‘King George V’ locomotive and tender realised £1,593. And this scratch built gauge 1 SR 34071 ‘601 Squadron’ locomotive and tender sold for £1,416. The G gauge section was particularly strong this sale. Highlights include this Aster Hobby (LGB) SchBB maroon 60 NGG 13 Drakensberg Beyer-Garratt 2-8-8-2 locomotive which realised £2,596. 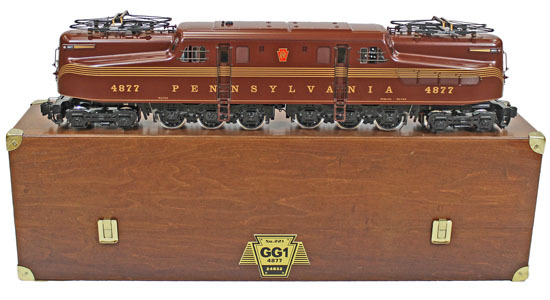 And this Pennsylvania Railroad maroon 4877 GG1 4-6-6-4 electric No. 24832 locomotive which achieved £1,888. The O gauge section was similarly strong with examples such as this Sunset Models (3rd Rail Division) brass Union Pacific silver, grey and black 9000 O Class 4-12-2 locomotive and 12 wheel tender sold for £566. This older Bassett-Lowke LMS ‘Princess Coronation’ Class 4-6-2 LMS 6232 ‘Duchess of Montrose’ No. 5613/0 maroon 12volt DC 3-rail locomotive and tender realised £1,062. A lovely selection of O gauge Lawrence Models were offered in this auction. Highlights include this pair of Midland maroon 8 wheel coaches with 2093 3rd/Brake and 3086 1st/3rd which achieved £619. And this M&GN light brown 24 Class A 4-4-0 locomotive and tender sold for £354. In the OO gauge this Wrenn BR green 34004 Yeovil 4-6-2 locomotive and tender No W2268A realised £708. Our next Model Railway auction will be held on Wednesday 19th July 2017. The full catalogue for this sale will be on our website in the next few weeks or keep an eye on our Twitter and Facebook pages which will include updates of our latest auction news. Are you thinking of selling your model railway collection or perhaps part of it? Would you like us to value your collection of model railway and give you advice on how best to market it? Visit our selling model railway page for more information or call us on 01926 499 031 and ask to speak to one of our experts.